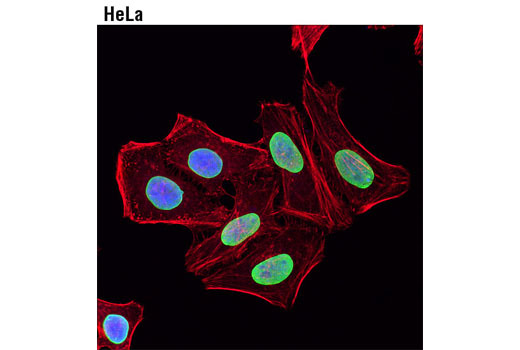 Confocal immunofluorescent analysis of HeLa cells using Lamin A/C (4C11) Mouse mAb #4777 (green). Actin filaments were labeled with DyLight™ 594 Phalloidin (red). Blue pseudocolor = DRAQ5® #4084 (fluorescent DNA dye). DyLight™ 594 Phalloidin allows researchers to fluorescently label the cytoskeleton of fixed cells through the binding of phalloidin to F-actin. This product is not intended for use on live cells due to the toxicity associated with phalloidin. After reconstitution the stock solution provides enough material to perform 300 assays based on a 1:20 dilution and a 100 μl assay volume. DyLight™ 594 Fluorescent Properties: Excitation: 585 nm, Emission: 613 nm. To make a 20X stock, reconstitute the lyophilized material in 1.5 ml pure methanol. Fix cells for 15 minutes using fresh, methanol-free 4% formaldehyde, then rinse three times in PBS for 5 minutes each. Once fixed, please follow Cell Signaling Technology protocol for immunofluorescence. Following incubation of the primary and secondary antibodies, DyLight™ 594 Phalloidin can be diluted 1:20 (5 µl per 100 µl assay volume) in PBS and added to the cells. Allow to incubate for 15 minutes at room temperature, then rinse once with PBS. Coverslip slides with ProLong® Gold Antifade Reagent #9071 and examine specimen using appropriate excitation wavelength. This material is provided as lyophilized solid that is stable for 1 year at -20°C, desiccated and protected from light. Phalloidin conjugates should be reconstituted in pure methanol to make stock solutions, please refer to the directions for use for details. Once reconstituted in pure methanol, stock solutions are stable for 1 year at -20°C, desiccated and protected from light. Stability in aqueous solutions is low and the conjugate should only be in the presence of an aqueous solution during incubation with cells. Actin is a ubiquitous eukaryotic protein and a major component of the cytoskeleton. At least six isoforms are known in mammals. Nonmuscle β- and γ-actin, also known as cytoplasmic actin, are predominantly expressed in nonmuscle cells to control cell structure and motility (1). Actin exists mainly as a fibrous polymer called F-actin. In response to cytoskeletal reorganizing signals during processes such as cytokinesis, endocytosis, or stress, cofilin promotes fragmentation and depolymerization of F-actin resulting in an increase in the monomeric globular G-actin form (2). Phalloidin is a naturally occurring toxic bicyclic peptide found in the deathcap toadstool, Amanita phalloides, which rapidly binds to F-actin with strong affinity (3). Lengsfeld, A.M. et al. (1974) Proc Natl Acad Sci U S A 71, 2803-7.